It’s the last day of Gujarat election campaigning and parties are leaving no stone unturned to dazzle voters and one-up the rival. While PM Narendra Modi took a seaplane ride over Sabarmati river, Congress leader Rahul Gandhi visited the Jagannath Temple and addressed his first press conference as the party’s president-elect. The party’s OBC leader Alpesh Thakor, meanwhile, accused the PM of splurging on imported mushrooms. Here's what people of Gujarat think about the Seaplane ride by PM Narendra Modi. 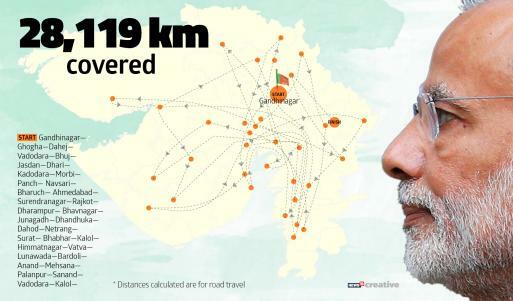 As the campaigning for Phase 2 of Gujarat comes to an end, take a look at Rahul Gandhi’s campaign road map. In the last phase of his temple run during Gujarat elections campaign, Rahul Gandhi was on Sunday greeted by BJP supporters chanting 'Modi, Modi'. The Congress scion smiled at them and moved on. No Gujarati will let go off a golden opportunity of development of our youth and coming generations. Victory of BJP is a guarantee for a bright future, said PM Narendra Modi on Twitter. I am devoting my life for the betterment of crores of people of Gujarat and India. Have been fortunate to always get your blessings. I am sure you will continue to bless us in these elections too by voting for BJP he has tweeted. I am devoting my life for the betterment of crores of people of Gujarat and India. Have been fortunate to always get your blessings. I am sure you will continue to bless us in these elections too by voting for BJP. PM Modi attacks Opposition, he wrote: The lies that our worthy opponents have spread, about Gujarat, Gujarat’s growth and about me personally is something I had never imagined. It is natural for every Gujarati to feel hurt. People of Gujarat will give a fitting reply to the negativity and lies of the opposition. With the Government of India and Government of Gujarat working together, the strength rises manifold. This 1+ 1 is not 2 but 11 and together we will take Gujarat to new heights. The lies that our worthy opponents have spread, about Gujarat, Gujarat’s growth and about me personally is something I had never imagined. It is natural for every Gujarati to feel hurt. People of Gujarat will give a fitting reply to the negativity and lies of the opposition. Campaigning for the Gujarat Assembly Elections 2017 ends. After three and a half years, I got the honour to travel across the length and breadth of Gujarat to seek the blessings of the people. During my travels across Gujarat, the level of affection I have received from the people is unparalleled in my 40 years of public life. This affection gives me strength and motivates me to devote all my time for India’s development. I urge my sisters and brothers of Gujarat to vote in record numbers on the 14th. I call upon the people of Gujarat to not only give the BJP an overwhelming majority but also ensure that BJP wins in every polling booth across the state. The experience of travelling on a sea plane from Ahmedabad’s Sabarmati River to Dharoi Dam was unique, said PM Narendra Modi on Twitter. Sea plane services can also be helpful during times of medical emergencies. Those needing even quicker access to medical care and those living in remote areas stand to gain a lot, he has tweeted. Prime Minister Narendra Modi took to Twiiter to narrate his experience on the last day of Gujarat campaigning. He wrote: My campaign journey in Gujarat, which began with the blessings of Ashapura Mata, ended today with the blessings Maa Amba. Experienced tremendous spiritual bliss and satisfaction of karma yog. Thanks to the blessings of Amba Maa and the Janta Darshan, which is akin to Ishwar darshan, across Gujarat, I derive renewed strength to work for India. My determination to work towards India’s transformation got fresh vigour earlier today, I travelled on a sea plane from Ahmedabad’s Sabarmati river to Dharoi Dam, taking off and landing on water. This experience was unique. It adds strength to our resolve to harness waterways for india’s progress. Effective use of waterways augurs well for tourism. Places like Andaman and Nicobar Islands, Lakshadweep, our vibrant North East, places with many water bodies, big dams, waterways will benefit with usage of sea planes. More tourism also brings greater economic opportunities. Sea plane services can also be helpful during times of medical emergencies. Those needing even quicker access to medical care and those living in remote areas stand to gain a lot. 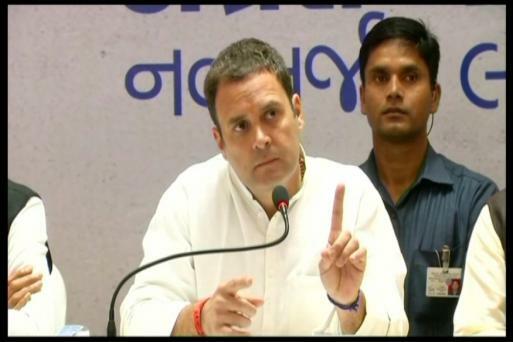 On the last day of campaigning for Gujarat elections, Congress President-elect Rahul Gandhi accused PM Narendra Modi of trying to skirt issues of development. Taking a dig at Rahul Gandhi, Union Minister Ravi Shankar Parasad said, development in Gujarat has taken place due to hard work and not visiting temples. Also, GDP has grown many fold during 22 years of BJP rule in the state. Rubbishing allegations that PM Narendra Modi does not speak of development is totally wrong, he further said, Congress has looted the country in the name of development and Rahul is doing nothing but lying. 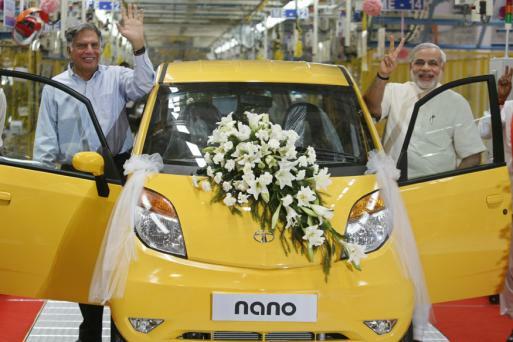 Eight years hence, locals and opposition leaders claim the benefits of the much-publicized Tata factory have hardly trickled down to those on the ground - a damning critique of the 'Gujarat model' itself. Former Gujarat Pradesh Congress Committee Arjun Modhwadia, meanwhile, has tweeted claiming it was the UPA government which introduced seaplanes in India. PM Narendra Modi is once again aboard the seaplane, returning from Dharoi Dam. Dalit leader Jignesh Mewai, who is contesting the election as an Independent, also attacked PM Narendra Modi over the seaplane trip. "There is nothing wrong in a seaplane or flying in one. It's a good thing in fact. But it's a political distraction. The real question is, what has the BJP done in 22 years?" says Congress president Rahul Gandhi. "In the last 3 months, I've gotten a lot of love from Gujarat. I am never going to be able to forget this experience. This has touched me. My priorities now lie with strengthening the Congress. I want to change the nature of the political discourse," says Congress president Rahul Gandhi. "The people of Gujarat are very intelligent, they can see that PM Narendra Modi is not talking about corruption or farmers in his rallies. There is a massive undercurrent, I am a little surprised, I had expected BJP to fight with more strength," says Congress president Rahul Gandhi. "The way Narendra Modi has talked about Manmohan Singh, it is not acceptable. Meanwhile, I have made my position clear about Mani Shankar Aiyar's comment. Modi is the Prime Minister of our country and it is not acceptable to talk about the PM like that. In the same way, talking about Manmohan Singh that way is unaccpetable as well," says Congress president Rahul Gandhi. "The BJP is nervous and everybody knows that. This time around, the results will be incredible. The BJP is in fact scared. I was expecting the BJP to fight with their full strength but they haven't," says Congress president Rahul Gandhi. "The BJP is not able to explain what it did in the last 22 years. They are not even able to talk about the Rafale deal, which reeks of corruption. After 22 years, Congress party has realised its strength in Gujarat," says Congress president Rahul Gandhi. "This time, even the BJP is saying that we are fighting the election very effectively. BJP is unable to make a narrative to talk about a single issue. The ruling party has not been able to sustain its campaign," says Congress president Rahul Gandhi. "Whatever decisions we take about Gujarat, it will be done after talking to the people of Gujarat. After listening to their voices. No decision will be taken unilaterally," says Congress president Rahul Gandhi. "Visiting temples is not wrong. I prayed for the bright future of the people at every temple. What's the harm is visiting temples? I have visited Kedarnath as well. Its just a BJP theory that I have never visited a temple," says Congress president Rahul Gandhi. "The BJP is not able to maintain its position during their campaign. The Prime Minister has stopped using the work corruption and has moved on to talking about himself. We are very confident that we will win the elections and the confidence comes from our understanding of first phase polling," says Congress president Rahul Gandhi. "In the last 22 years, PM Modi has conducted only one-sided development. Only 5-6 people have benefitted from it and the rest of Gujarat has been ignored. Even in education, 90% of the colleges in the state have been privatised," says Congress president Rahul Gandhi. "We started our campaign about 3-4 months back. We met people from every strata of society. We have a vision for every class of people in Gujarat," says Congress president Rahul Gandhi. The Congress has mocked Modi's seaplane ride, calling him 'hawa hawai', a pun on the classic song from Anil Kapoor and Sridevi-starrer Mr. India. "Today is a historic day. Prime Minister Narendra Modi travelled in a seaplane. It will be a huge revolution in the transport sector. India has huge potential. Also, as per the rules, a Prime Minister can choose any mode of transport. It has nothing to do with Gujarat Elections. If Rahul Gandhi wants to try it out, he can do so too. There is no politics in it," says Nitin Gadkari.